In order to spark a discussion of the significance or relevance of “epistemic democracy” to the use of randomly selected assemblies, juries, or other minipublics, I paste my (very positive) review of Democratic Reason. A short paper by David Estlund called “Introduction to Epistemic Approaches to Democracy” names at least four flavors of epistemic democracy. I believe Landemore’s is it’s “purest” form and therefore a good one to discuss. How relevant or significant is the epistemic approach? How relevant or significant is the work on diversity and group decision making? How much does all this depend on empirical work not yet done by political scientists? What empirical studies are out there that Kleroterians would recommend to other sortinistas and to the general public? This book follows the recent trend in democratic theory termed “epistemic democracy” in a novel way. Rather than relying on liberal philosophy or an analogy with science, it begins with results in mathematics, decision theory, psychology and cognitive science. It also mentions an evolutionary basis for the superiority of group decision making. Bob Moore wrote to call attention to the website of Democracy for the USA – a new organization that advocates replacing elections with sortition. Democracy for the USA is based in Chicago and bills itself as an outgrowth of the Occupy Chicago movement aiming to rectify the deficiency of Occupy’s platform – the lack of a workable alternative to the electoral system. The heart of democracy is the community meeting. Of course there are already neighborhood meetings, but these do not determine government policy; they are not effective instruments of popular power. In a democratic USA, by contrast, the people will exercise sovereign rule collectively through regular and frequent community meetings across the country. Unlike the political system now in place, there will be no bodies of politicians–a Congress, state legislatures, city councils–drafting our laws. There will be no lobbyists, no groups such as ALEC, usurping the process. Neither will there be a president, governors, or mayors directing the government. Instead, through Community Assemblies and Executive Councils staffed by ordinary citizens selected by lot, everyone will truly have an equal voice in policy-making and an equal opportunity of serving in government. In essence it is really this simple. We will not get anywhere flailing away within the confines of the current political structures. We will be like rats running around in a maze, succeeding perhaps in making life a little less unbearable for some people in spots, but ultimately getting nowhere fast. In the meantime the earth will be consumed and we will find ourselves in a condition of serfdom or worse. We have no option: we have to make the necessary change from the current system to democracy. The website links to Ted Aranda’s The Racket and the Answer, that is apparently based on his 2008 Ph.D. thesis. and it focuses upon the workshop held in 2012 at Trinity College Dublin. Among other topics, it mentions an article from the Yale Law Journal that contrasts voting, lotteries, and rotation. Does anyone know which article is being referenced here? 1) It ended class warfare and created a harmonious community. 2) It provided free citizen warriors (in the form of naval rowers) who identified with the state and were therefore willing to make sacrifices for it. Woodruff says that if so many rowers were not needed for Athenian navies’ ships, elites may not have allowed the people (the many) to wield as much power as they did. Being not at all a historian, I ask those who know more about ancient history to agree or disagree with the above assessment. Did military need provide the conditions for democracy in Athens? Does the state (or elites) today need something in exchange for genuine democracy? What would today’s state (or elites) want from the people in return? Citizen consumers? This is from a site that contains, among other things: idiosyncratic, vernacular reviews of “Dead Media”. In this case, the technology surrounding Athenian use of sortition. The author does so via a tour of the Agora Museum in Athens. 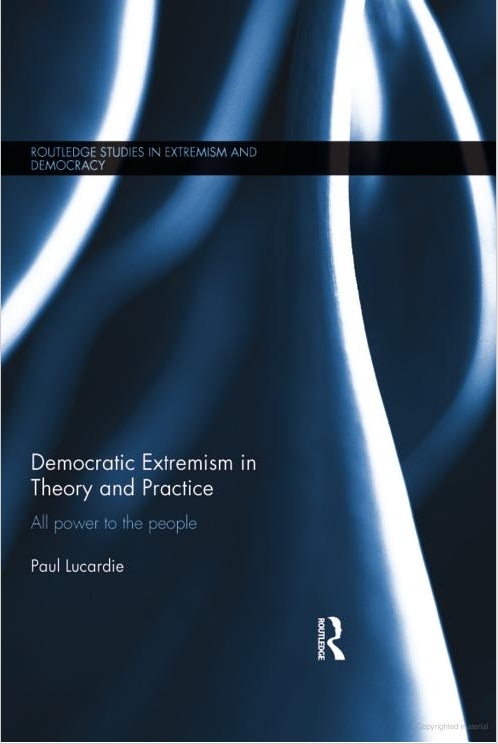 Paul Lucardie sent the following excerpts from his new book ‘Democratic Extremism in Theory and Practice. All power to the people’ (London: Routledge, 2014). Author’s comment: Democratic extremism may appear to be an oxymoron, as ‘democracy’ is usually associated with moderation, pluralism and tolerance. Yet one could also regard democratic extremism as the opposite of autocratic and aristocratic extremism: whereas the latter imply that all decisions are taken by a dictator, a class of landowners or perhaps (in a more modern variety) the Central Committee of a ruling Communist Party, the former means that all decisions are taken by the people and that a political elite does not play any significant role. Examples of extreme democracy are rare, as far as I could find out. More common are cases of what I would call radical democracy: not all decisions but most important decisions are taken by the people, some are left to a political elite. Even more common, however, are mixed regimes where most decisions are taken by an elected aristocracy (professional politicians) and some by the people. In fact most so-called representative democracies are, in my opinion, mixed regimes, if not elective aristocracies.